So here we are again, Monday night or should I say late Monday night in fact its nearly Tuesday probably will be by the time I’ve waffled on and finished this post, The start of another productive week well fingers crossed anyway. Well it was my son’s 4th birthday today and it has been Scooby Doo all day long although I’m not complaining as I do like the old Scoob cartoons. So now that he’s nodded off I get to do some more work, “Yes” as you can imagine I’m jumping for joy! Who I’m I kidding I love talking about new pieces of jewellery I’ve made and I really love this Sterling Silver Coin Pearl bracelet which due to the design some people call a “Sweetie Bracelet” and to be honest it sure does look good enough to eat I must say. I love designing romantic feminine jewellery and at the end of making this one it made me smile because it turned out better then the image I had in my head. The focal point of this bracelet is a huge 15mm freshwater coin pearl, Very round in shape also very smooth and a vibrant glow to go. Coin pearls of this quality are really hard to find so I had to make something nice with them didn’t I. Around the coin I made a cluster of mixed round freshwater pearls from 2.5mm ones to 5mm, And amongst these I added a few Crystal Quartz rondelles for a little sparkle or two. I love the silver rings we use on our bracelets, Two jump rings soldered together to make a nice and shiny weighty bracelet, It’s nice to be IndiviJewel and different from everyone else who makes similar jewellery with the same components, It just gives it a unique look which is what we are all about. Now the heart toggle I have used lately I think I’m going to use this on quite a few of my designs as it is really good quality, Nice and sturdy and a lovely stand out component on its own. 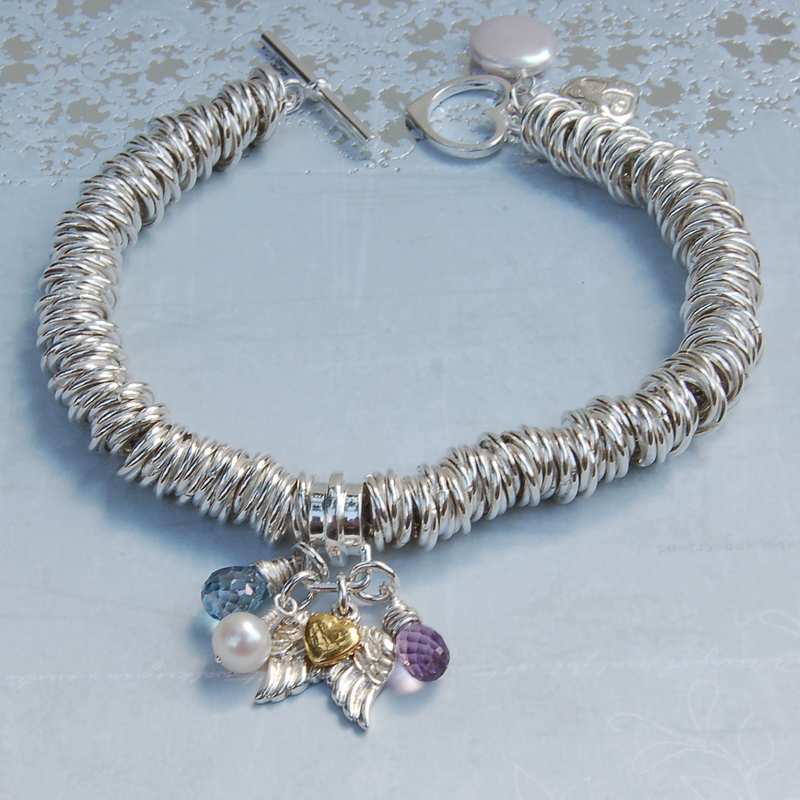 Now when I make bracelets I always like to add something near the toggle, I just think it looks classy and if you use the right component can make your jewellery have a nice contrast like I’ve done with this bracelet. I have used a very beautiful and big grapefruit quartz fat pear, I’m I allowed to say that or will I get told off by the PC brigade, Anyway it breaks the bracelet up and gives it a bit of razzmatazz, No idea why that word popped into my head, Must be watching all those retro cartoons earlier! Now on this bracelet I’ve used a heart charm which I’ve used before and will in the future due to its intricate detail which makes it such a cute little charm which I adore and think everyone else would as well. So that about completes the story of this bracelet, Like my last silver rings bracelet the Angel wing I will be making necklaces to go with but trying to work on the designs at the moment because these are heavy bracelets if I made the necklaces the same your head would be bouncing off the pavement! Which wouldn’t look classy now would it. 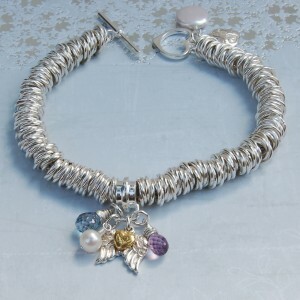 Now to look at the bracelet you automatically think wedding but like all the jewellery we design and make we do try to make it so that you can wear it with most things from T-shirt and jeans to business clothes to even a wedding maybe there’s a thought!. The design of this bracelet is to be a stand out piece without being over the top hideous “Look at me” which I think we achieved because when your wearing this your wrist will get looked at and you might even get asked where you got it from so please do tell them!, It’s so much better to see in the flesh this bracelet than the photo’s show, Even though the pics are good it doesn’t do the bracelet justice, It’s one of those where its just so alluring and desirable when looking at it that if you had one you wouldn’t want to take it off, If I was a women I know I wouldn’t! At the end of the day it’s the quality of components that make this bracelet look the way it does, You can have a great design but if you don’t have equally as good materials then it won’t work, All the materials used on this bracelet are really high quality so as you can see by this blog I’m happy so I’m off to bed now, See yer next time if you have a minute or two to spare. Well here we are, Autumn creeping upon us again, Dark nights closing in so its just as well we are here to brighten you up with some colourful sparkling jewellery. Our latest piece is a heavy weight Sterling silver rings bracelet, Some people may call it a sweetie bracelet and it does look good enough to eat, BOOM BOOM! come on that’s really good for me. As you know we have so many new designs just waiting to be made, Ive had this idea for sometime and now the new website is up and running (Nearly) we want to add non-personalised pieces as well as personalised as not everyone wants something with text on although any of our designs can be personalised due to making them ourselves so if you like the design but want it personalised then just let us know. OK so I have to say I love this design it just has everything a piece of jewellery should have, Sparkle, colour, elegance, quality and just all round desirable. So first of all we start with a sterling silver belcher chain, This is a heavy piece so needs to have a solid base. We then have the sterling silver rings which are two jump rings soldered into one to make a unique look. Now for the main cluster of charms we have the sterling silver Angel wings charm with the little gold vermeil heart that makes a great contrast. Next we have the sparkling gemstones, On one side we have a lilac Amethyst briolette pear drop and on the other we have a London blue Topaz briolette pear drop which is equally dazzling and to add more contrast we added a freshwater round pearl. 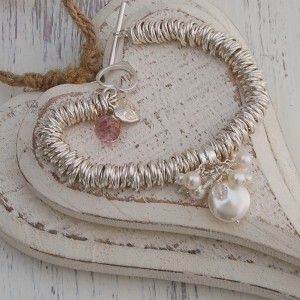 To finish the bracelet off we used a lovely heart toggle and on the heart toggle side we added a couple of more charms, One is a very hard to find coin pearl which has a great shape and luster to it and the other is a very cute heart which has two different sized hearts inside the main one making it a very intricate charm. Overall this is lovely bracelet that can be worn from day to day or for a special occasion such as a wedding, Again this design is unique to IndiviJewels so you can only purchase it from us and you sure will receive great comments and asked where you bought it from, So why be like all the rest be IndiviJewel!